Marc had the Monday holiday off and we decided to treat ourselves to lunch in San Francisco and I managed to slip in a trip to Ikea on our way back. While our ideal diet is grain-free (even if I eat more sprouted grains now that I am pregnant), processed foods-free, and only whole foods, we do splurge and treat ourselves. Marc’s a bit of a beer-lover (and a bit of a beer snob) and I will admit, when I went completely gluten-free, beer was actually the hardest to give up than anything else. Being pregnant has me not drinking at all, but when I wasn’t pregnant, I would enjoy a [good] beer now and then. The Bay bridge was actually open yesterday going West Bound (they had planned to work on it during the holiday weekend). We had ABSOLUTELY NO TRAFFIC. We didn’t even have to wait in line at the toll. We got to our SF destination in about 20-30 minutes less than usual. We had planned to go to Thirsty Beer Brewing Company – organic craft beer + tapas. We even called on Saturday evening to confirm they would be open, and after finding parking, we walk up to the restaurant and it says it is closed for the holiday! I was a little hangry, but I’m not one to let little things ruin my day. I emailed them the next day and the manager was very nice. Marc really wanted to go to The Monk’s Kettle and after rereading their menu, their hamburger sounded really good and I agreed. It was probably a good thing the other place was closed because The Monk’s Kettle was fantastic! So rich! I tried both of them; the sweetbreads practically didn’t require chewing they were so tender and I liked the apple and parsnip slaw. The beef cheeks were so so so so rich. I could barely even eat it. The crusty bits on the polenta was good though. Marc greatly enjoyed their beer selection (which is ginormous and high quality). I think the most common beer on tap was the Alagash White or maybe Stone’s Pale Ale… I guess that is a little subjective to where you are from though. Seriously one of the best burgers I have ever eaten. I’m one of those people who orders burgers WITHOUT cheese and then covers it in ketchup, but not this one! It was super juicy and tasted great. Their fries were really good too. We were lucky to get a little table when we got there (a little one sandwiched between 2 other little ones) because by the time we left, the place was PACKED. The service was great as well. We then walked a few blocks over to my favorite ice cream place – Xanath Ice Cream. I always get a small scoop of one of their vanilla flavors (so much vanilla and vanilla bean! The ice cream is a light-brown because of the vanilla! ), and a small scoop of their toffee, which pretty much tastes like brown sugar. Mission District never fails us when we want something good to eat! So while we were out enjoying the culinary delights of the bay and picking up curtains at Ikea, we had our Chile Verde cooking away at home. It may not look pretty, but it was still pretty tasty! Optional: Sear salt, pepper, and garlic seasoned pork before placing in slow-cooker. I usually do this, but did not this time around and it turned out fine. 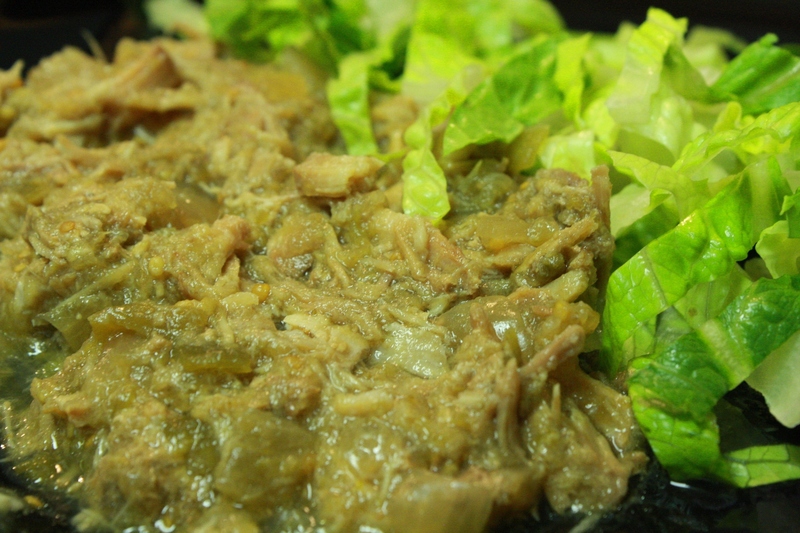 Add all ingredients, except pork, in slow-cooker and mix. Enjoy with eggs, salad, as taco or sandwich filling, or anything else you can think of!